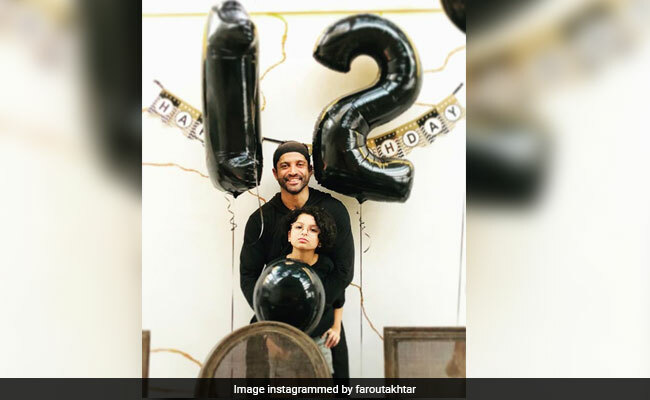 On Farhan Akhtar's younger daughter Akira's 12th birthday, the actor shared a heartfelt note for her on his Instagram timeline. He accompanied the note with a priceless photo of himself and his daughter, which appears to be from her birthday celebration today. Farhan and Akira can be seen twinning in black outfits in the picture. In the note, Farhan extended his birthday greeting to his daughter and wished that she "never loses the child inside" her. "Age 12 is generally considered to be the end of ones childhood but I wish that you never ever lose touch with the child inside you. The child is precious because she is curious, she is innocent, her smile reaches her eyes, she trusts people, she loves without judgment, she is not afraid to make a mistake and learn from it, she is sensitive to those around her but most of all, she is always herself. No matter what the world wants her to be. Happy birthday Akira. Love you to the moon and back," he captioned the picture. Farhan Akhtar, who is rumoured to be dating TV presenter Shibani Dandekar, divorced Adhuna Bhabani in April 2017. They had got married in 2000 and are parents to two daughters Shakya and Akira. On the work front, Farhan Akhtar will be next seen in Shonali Bose's The Sky Is Pink, which also stars Priyanka Chopra and Zaira Wasim. The Sky Is Pink is reportedly based on Aisha Chaudhary, a motivational speaker, who was diagnosed with pulmonary fibrosis at the age of 13. Farhan is also part of Omprakash Mehra's film Toofan in which he will play the role of a boxer.